Note: I am by no means an expert on either parenting techniques or sleep training. The information found in this post is derived from my experience as a mother. To date, my child does not form to the sleep training guidelines that are suggested by pediatricians, though he does follow the recommended hours of rest for someone his age. To all of you other parents with a little one who sleeps on their own schedule instead of yours: you are not alone. I can't think of a parenting book that I own that doesn't have a timeline for creating a sleep schedule for my baby. Like other areas of these parenting books, my child just doesn't fit into the mold. He continues to choose (with our encouragement) to sleep when he feels tired enough to actually fall sleep. He's kind enough to give us an expected time period. But for the most part, if he chooses to ignore the clock we don't panic and just choose to ignore it too. Here's why my child has a flexible sleep schedule. The Cry It Out Method wasn't a good fit for our family. 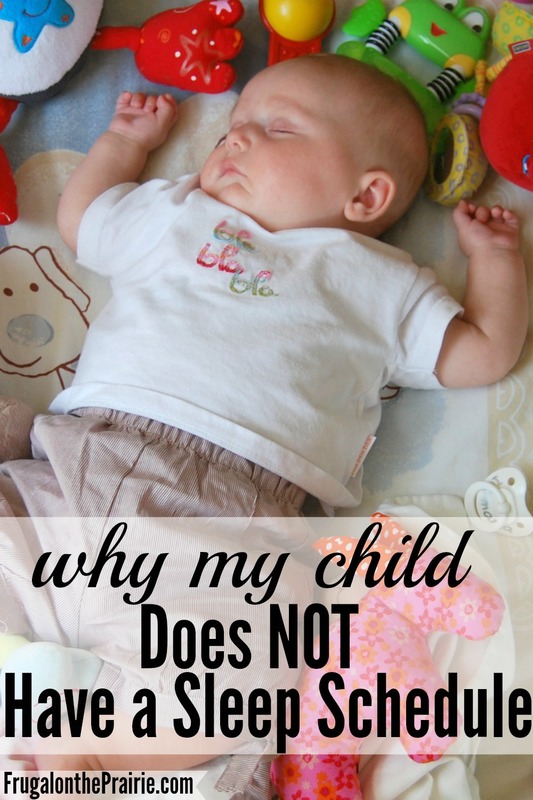 How can I put my baby to sleep at a set time if he just won't go to bed? The most commonly suggested answer to my problem was to try the Cry It Out Method. Regardless of where you stand on the controversial CIO Method debate, I think we can all agree in saying that if something doesn't work for your family you shouldn't feel pressured to do it. We felt extremely pressured to try this method but it just wasn't a good fit for us. Feel free to slap any label on us if you'd like. You can call me a sissy, weak, or a pushover. I've heard it all, believe me. But it didn't feel like the right path for us and that was a good enough reason to try alternatives. We like the flexibility of his sleep times. We are extremely fortunate in the fact that James has a very wide window as to when he needs to take a nap. He can start to feel tired at noon and either fall asleep right then or wait until 1:00pm. Keep in mind it is a very, very rare occasion that we will keep him awake beyond his sleep cues. But I like that I can avoid a car nap if I have an inflexible appointment time. He can be really cranky (who can blame him?) if he sleeps in the car so I try to avoid it as much as possible. We tried to "schedule" his sleep...and he never went to sleep. I know I'm not alone in the fact that my kid won't just fall peacefully into slumber at set times. He has a range where he typically gets tired, which is very helpful since I work from home. But he never goes to sleep at a set time on the dot. We let him decide when he falls ASLEEP but we decide when he PREPARES for bed. There is a huge difference between the two. While we are flexible around his sleepiness, we are firm about sticking to a bedtime prep schedule. At 7:00pm every night we make sure a bath, hushed tones, and bedtime stories take place. My kid is unique and so are his sleeping habits. Everyone's situation is different. Your child is unique and so is their sleep schedule. You are unique and so is your parenting style. Like all things involved with parenting you need to find what feels good. Each family dynamic, schedule, and setting varies. Simple logic tells you that sleep schedules will vary too. If you're like me and your child is a free spirit when it comes to the clock, you are not alone. I have begged, just like you. I have pleaded, just like you. I have followed my own path, just like you. And we are both rocking this thing called parenthood. Does your child stick to a sleep schedule? What are your best tips for sleep training?